Saturday, September 8, 2018 an election was held at the General Membership Meeting. 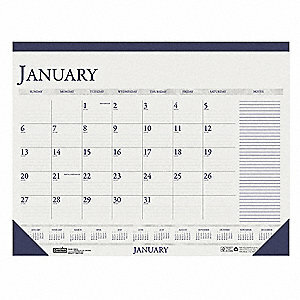 We have a new line called “Month at a Glance” in the History section check it out. Reunions have been held every year since 1986. Reunion sites have been: Arlington, TX; Washington, DC; Louisville, KY; Minneapolis, MN; Sacramento, CA; Philadelphia, PA; San Antonio, TX; Indianapolis, IN; Colorado Springs, CO; Appleton, WI; Louisville, KY; Las Vegas, NV; New Orleans, LA; San Diego, CA; Buffalo, NY; Ft. Myers, VA; Nashville, TN; Eugene OR; Daytona FL; Colorado Springs, CO; Kansas City, MO; Louisville, KY; Chicago, IL; Santa Clara, CA; Washington, DC; and Saint Louis, MO. ; Orlando, FL. ; Indianapolis, IN. ; Las Vegas, NV. ; Columbus, GA.; San Antonio, TX; Orlando, FL. ; Grand Rapids, MI. The 2019 reunion will be held in Las Vegas, NV. and Indianapolis, IN. has been chosen for the 2020 reunion. We have been able to reunite many of our brothers by keeping a computer master file of everyone we've found by their name, squadron and troop and their dates in-country. We update our rosters continuously to assure they are accurate and complete. We have reunited many buddies this way. 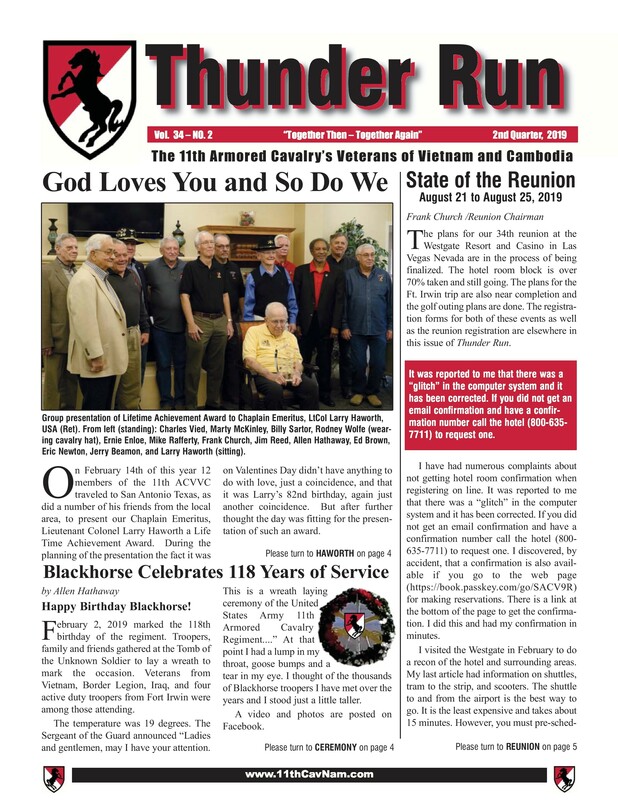 We publish a quarterly newsletter to each member of 11 ACVVC with reunion information, historical stories by our membership and information about our current members and events. Participation in contributing to the contents of the newsletter is encouraged to all. We provide scholarships to our K.I.A.’s children and grandchildren as well as children and grandchildren of our membership. In the past years we have provided over 1.5 million dollars in college scholarships! This program is one of our most coveted programs helping our children and grandchildren get an education and to become our leaders for the future of our country. 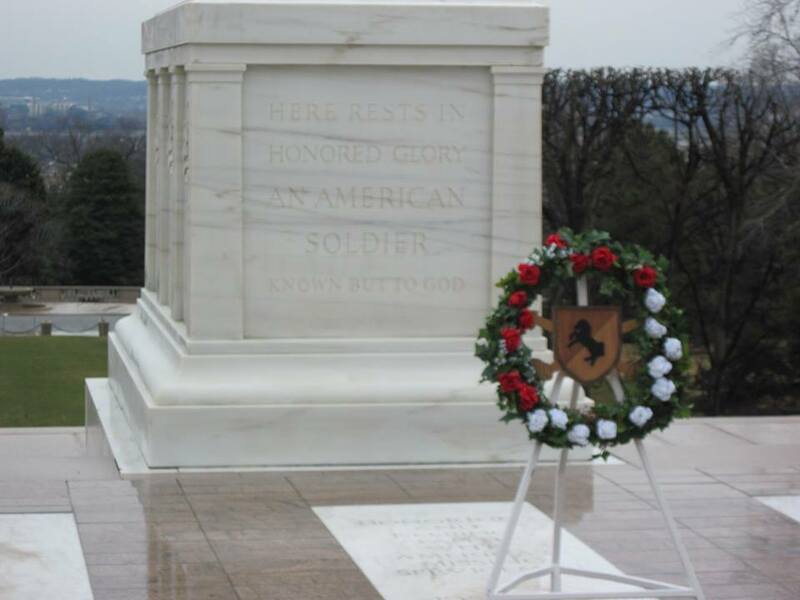 We remember our killed in action who lost their lives in Vietnam and Cambodia each Memorial Day & Veterans Day by placing a wreath at The Vietnam Veterans Memorial in Washington, D.C.
February 2, 2016 there will be a placing a wreath at The Tomb of the Unknown Soldiers in remembrance of the 115th Anniversary of the 11th US Cavalry. 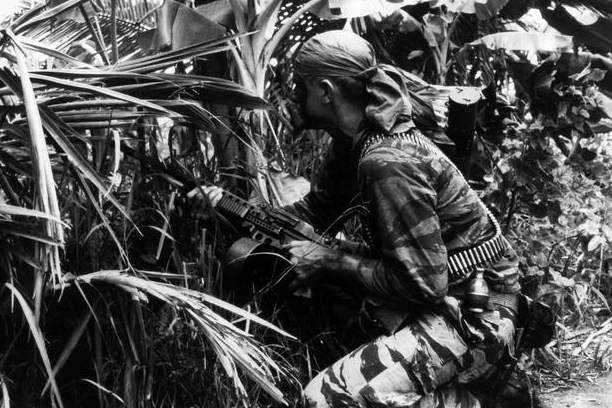 We continue to search for our brother veterans who served with us in Vietnam and Cambodia through special locators, mailings, handouts, and advertising in veteran newspapers and magazines. Our goal is to find ALL of our former troopers who served with us and to "Reunite The Regiment" again. 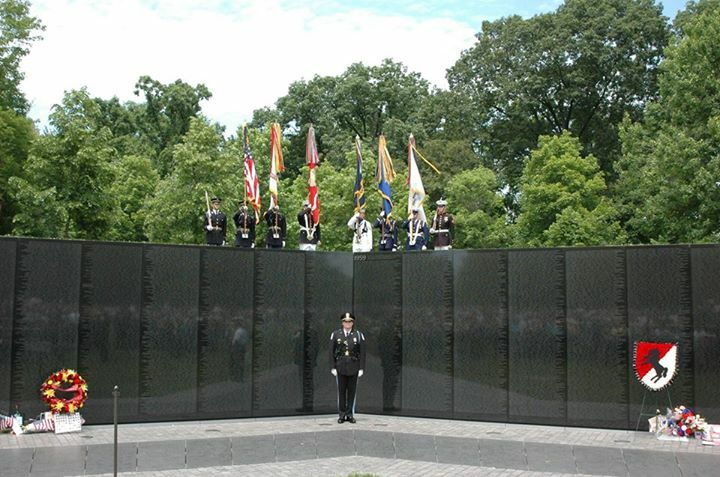 We answered our Country's call and served proudly with the best combat unit to have fought in the Vietnam War. This page is here to serve you! We welcome your suggestions as to page content, look, style, or any comments you may have. If you think we are missing something, tell us! Please Contact us HERE to provide your input. This page is constantly being updated to reflect new information as it becomes available and to make the page truly "your" page. It will always be improving (we hope!) and changing so please come back often. sunlit springtime of our youth. and a part of us is with them always." Want to join the 11th Cav Ring?